- Publisher Atgues that, rightly practiced, the Psalms of Israel make available an evangelical world of Yahweh's sovereigntya world marked by justice, righteousness, mercy, peace, and compassion. 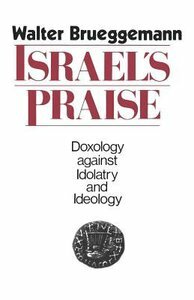 - Publisher Atgues that, rightly practiced, the Psalms of Israel make available an evangelical world of Yahweh's sovereignty a world marked by justice, righteousness, mercy, peace, and compassion. Atgues that, rightly practiced, the Psalms of Israel make available an evangelical world of Yahweh's sovereigntya world marked by justice, righteousness, mercy, peace, and compassion. Atgues that, rightly practiced, the Psalms of Israel make available an evangelical world of Yahweh's sovereignty a world marked by justice, righteousness, mercy, peace, and compassion.